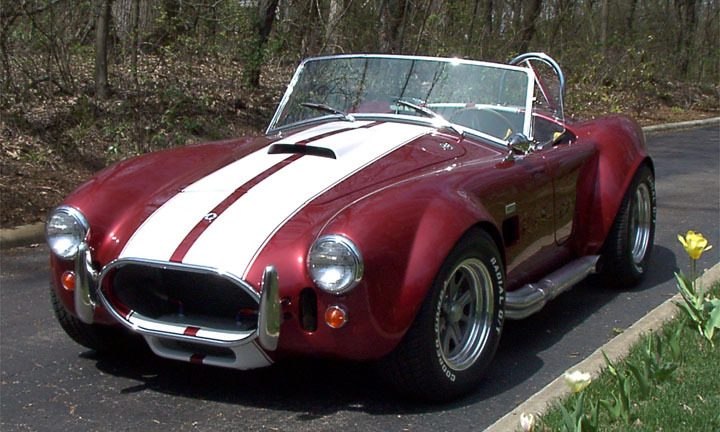 Back in 2004 I finished building a Cobra kit car. The kit I chose to use was from RUCC (RU Car Crafters where "RU" is Roger Upton - they're no longer in business). They (he) built a backbone chassis 427SC kit. I dropped in a 428SCJ. I built two separate "kits" - the drive train, which included the 428SCJ and a toploader transmission, and the Cobra itself. I've not yet found another site detailing the RUCC kit, so I hope to do what others have done for Factory Five and Lone Star kits - give a detailed blow-by-blow diary of the construction. I've taken a trip to visit RUCC and have a page dedicated to that visit with some details of the RUCC operation. Enjoy your visit. Additional template for mounting the wiring harness bulkhead connector. Brakes (including a later addtion of an emergency brake). Information on rear-caliper clearances with 15" wheels. Some updates to the Roll Bar. In particular, I've glassed in a "weather seal" where the roll bar passes through the side wall of the trunk. Want to know more about the RUCC kit? Visit the Club Cobra web site or see my copy of the RUCC Flyer This contains information on the RUCC kit contents, packages and pricing (check with RUCC for the latest pricing and package information).